A popular, very scenic lake on the Montana / Idaho border. A great day hike or easy overnighter. Can be extended several ways, so makes a good basecamp to explore the area. The books say this is an easy two miles, and that’s what it looks like on the topo map too, but I think it is closer to three, and because the steep part of the climb comes late, this hike seems more challenging than it is typically positioned. We often see obviously casual hikers who thought they would zip up to the lake for a summer swim really dragging in the last half mile. So it’s a little more challenging than conventional wisdom, but it’s popular for a reason. The trail itself is a nice mix of terrain and views. On a weekend morning in late July the wet underbrush soaked our hiking shorts through. This area, especially on the lower part of the hike, is relatively lush. There is a pretty little cascade in the first fifteen minutes of the hike that is worth a look. You hear the creek off and on as you ascend, but most of the water on the trail is side-streams. Lots of opportunities to keep the pooch cool and hydrated. The final stream crossing happens right before the lake and is the only one without some kind of bridge. No big deal but kind of odd. Make a sharp left after this crossing for the most direct path to the lake. There are some established campsites on this end of the lake including one that is right on the main access trail. It is often occupied when many superior sites are empty. If you are tempted to camp here, scout around a bit - you can do better! 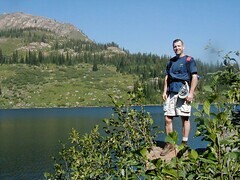 The trail skirts the left side of the lake and provides few good access points. Near the end of the lake the trail turns left again and climbs fairly steeply to the next shelf and Pearl Lake. From there it climbs to a notch with a view down into Dalton Lake, or you can continue up to the stateline trail. Beginning late July this is huckleberry country. We also saw five mountain goats perched high on the cliffs beyond the far end of the lake. From MIssoula, drive 57 miles to Superior. Cross back under the freeway, get on the frontage road heading back towards Missoula, and just follow the road (becomes Trout Creek Road) for a total of about 19 miles to the trailhead. It is paved the first six miles, then becomes pretty good gravel.